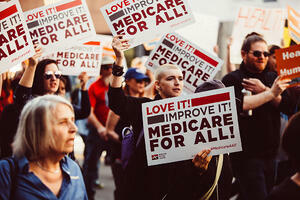 MEDICARE FOR ALL: Good POLICY or Good Politics? During the most recent mid-term elections, Healthcare continued to rank atop the list of those things most important to Americans. According to Gallup, 80% of Registered Voters listed healthcare as either extremely or very important, followed closely by the Economy and Immigration both at 78 percent. With Republicans failing to do anything comprehensive regarding health care during their recent control of both houses of Congress as well as the Executive branch, the U.S. finds itself once again in a discussion around the government’s role in solving America’s health care crisis. Among the solutions most touted by Democrats is the idea of a ‘Medicare for All’ platform. No question that in America, something should be done to insure that every citizen has access to quality affordable health care, how we accomplish this may be a bit more complex than the broad brush of ‘single payer.’ While the idea of nationalized medicine might sound good to many Americans and makes for a good talking point on the cable news talk shows, when it comes to government run healthcare, the devil may most certainly be found in the details. Our team at GDP Advisors reviewed ‘Medicare for All’ (specifically the plan outlined by Senator Sanders), and have compiled our thoughts and opinions on the measure.